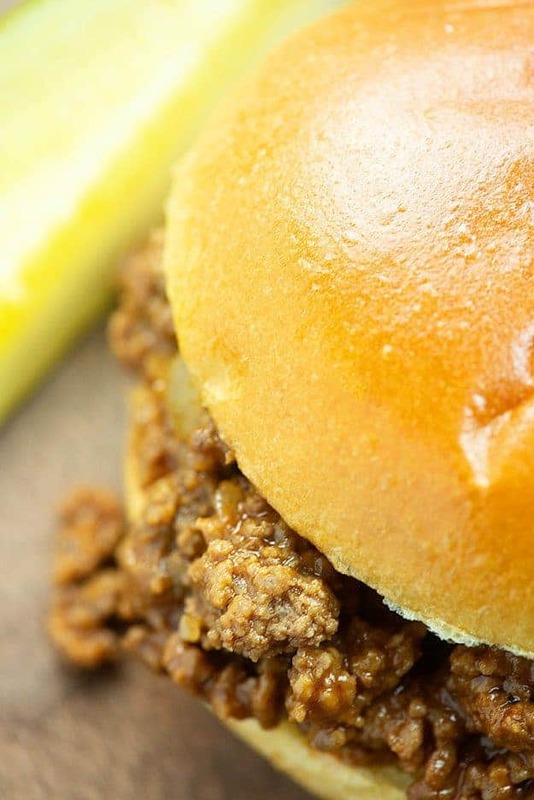 Homemade sloppy joes are nearly as easy as using the canned sauce, but they taste oh so much better! 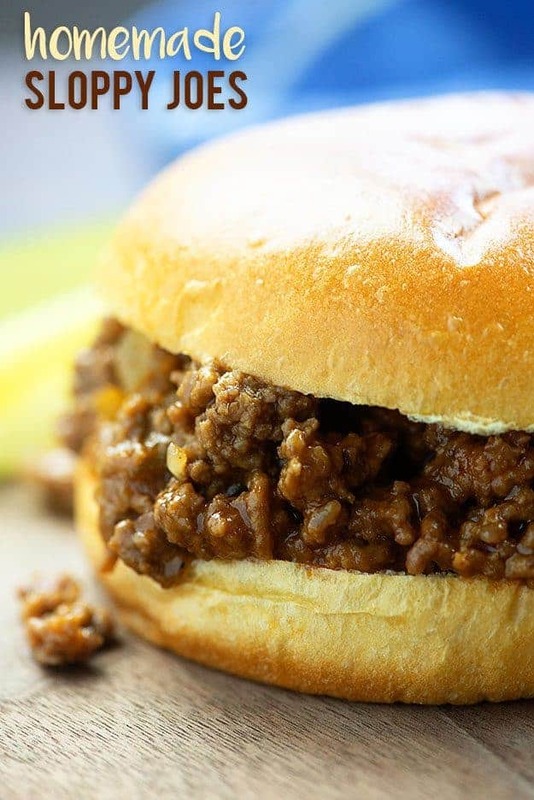 Kids and adults both love this sloppy joe recipe with my sweet and tangy sauce. Pile on some pickles and serve alongside some potato chips. I’m a sloppy joe fanatic. I make them just about every week for either lunch or dinner and I’ll probably never get tired of it. Same with tacos. We could eat sloppy joes and tacos every week and no one would ever complain! Is the same true in your house? My homemade sloppy joe recipe is nearly as easy as the kind that comes in a can, but woah. So much tastier! 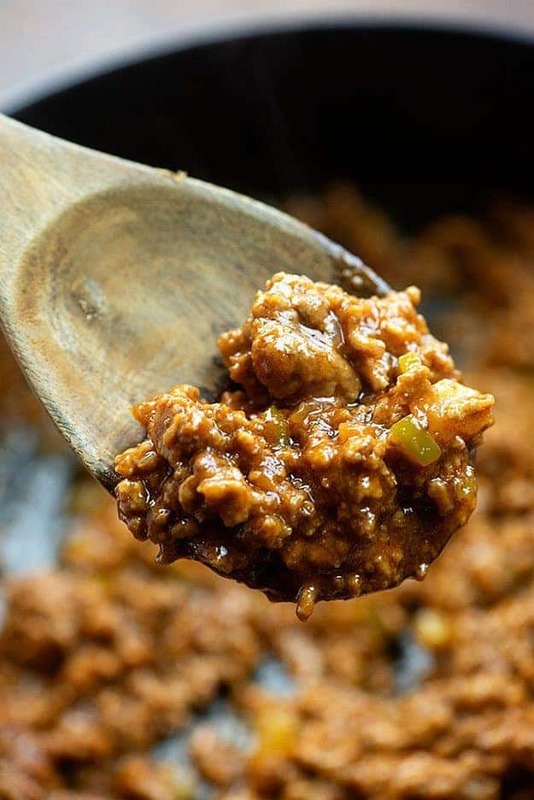 This homemade sloppy joe sauce is just the right amount of sweet with a bit of vinegar and mustard to balance it out with some tanginess. Let’s start with the most important step! The sauce. You’ll just whisk together ketchup, mustard, brown sugar, vinegar, Worcestershire sauce, salt, and pepper in a small bowl or mason jar. Once the mixture is well combined, set it aside and get started on the beef. Brown a pound of ground beef in a large skillet, breaking it up as it cooks. When the meat is about halfway cooked through (you should still have lots of pink throughout), add in some chopped onion, bell pepper, and garlic. If you have picky kids (or a picky husband, like I do) you can 100% omit the onions and peppers. Anytime I make this for dinner (meaning my husband is home to eat it), I leave the onions out. If I make this for lunch while he’s at work, I leave the onions in. Totally works both ways! 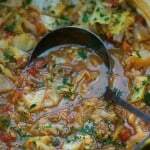 Continue cooking and stirring until the meat is cooked through and the veggies have softened. Drain off the fat. 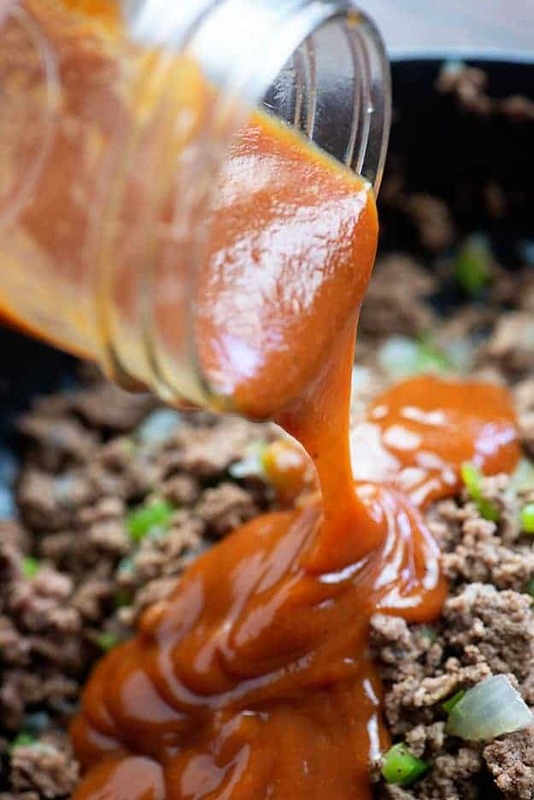 Pour that homemade sloppy joe sauce right over the meat and stir it all up. Simmer this mixture for about 5 minutes. Spoon this mixture into your sandwich rolls. 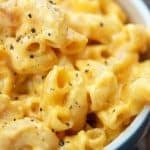 So easy and always a kid-pleaser! I like to top mine with dill pickle slices or some dill pickle slaw, but you can keep things simple and just serve as is, if you like. These go great with a pile of potato chips on the side. 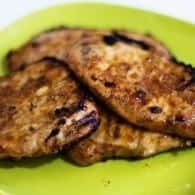 Can you use turkey or chicken instead of beef? 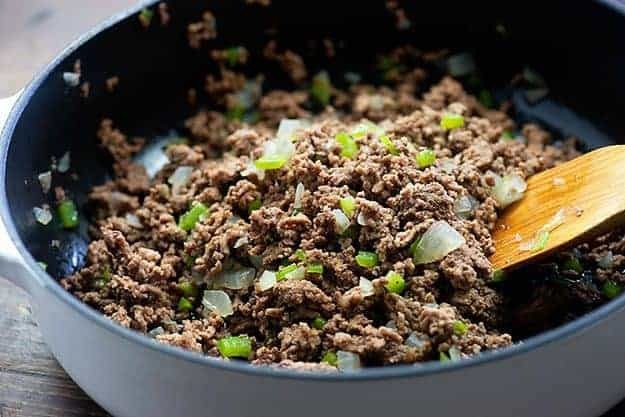 Heat a couple teaspoons of oil in the skillet, add your ground turkey or chicken, and cook just like you would beef. Potato Soup: The kids love topping their soup off with extra cheese and bacon and I love how easy it is to throw this in the crockpot. Fried Tacos: We eat soft tacos about once a week, but everyone cheers when they see me making their beloved fried tacos! French Dip: This sandwich is beyond easy to make in the crockpot and the kids are happy to eat the leftovers for days! 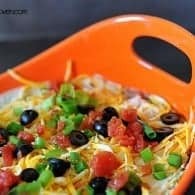 Crockpot BBQ Chicken: If there is one thing my whole family loves, it’s BBQ! 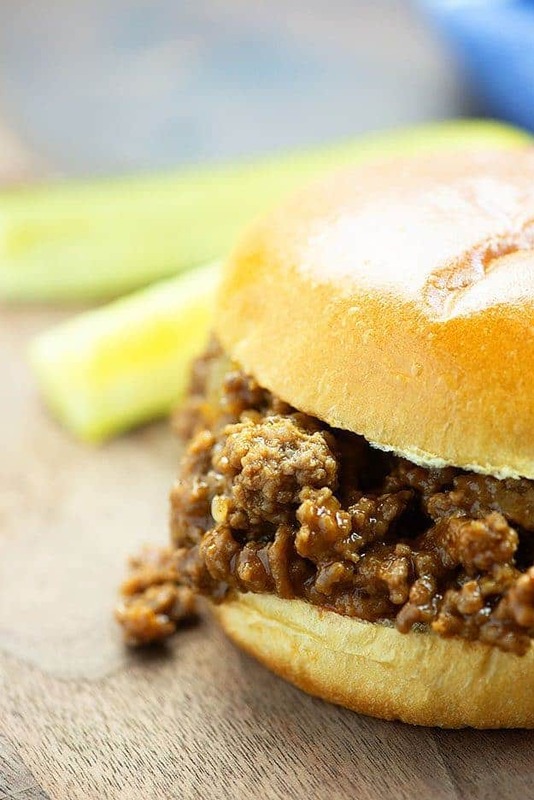 Homemade sloppy joes are nearly as easy as using a can of sauce, but oh so much tastier! Brown the ground beef over medium heat, breaking it up as it cooks. 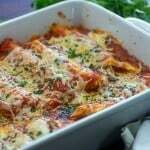 When beef is partially cooked through, add the onion, pepper, and garlic to the pan and continue cooking and stirring until meat is fully cooked and vegetables have softened. Drain grease and return to the pan. 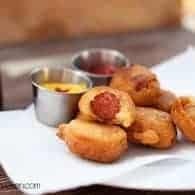 Add the ketchup, mustard, vinegar, brown sugar, Worcestershire sauce, salt, and pepper to a small bowl and whisk well to combine. Pour the sauce over the ground beef and stir to coat. Simmer the meat mixture for 5 minutes before spooning onto sandwich rolls. Use any color bell pepper you prefer or leave it out entirely if you have picky eaters. I adored Sloppy Joes as a kid but haven’t had them in years. 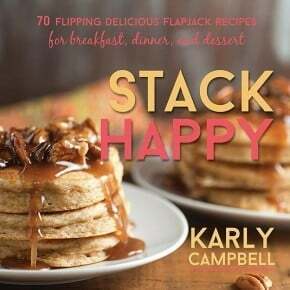 We only ever had the jarred sauce, but this looks so easy and so delicious! 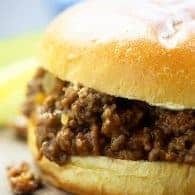 It’s time to introduce my kids to Sloppy Joes! I can’t imagine sloppy Joe’s without onions! Put onions & peppers in food processor & grind them up before putting in with meat. 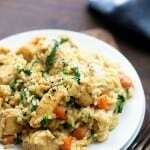 This will take care of the texture issue and you can still have the lovely added flavor. This is so ironic! 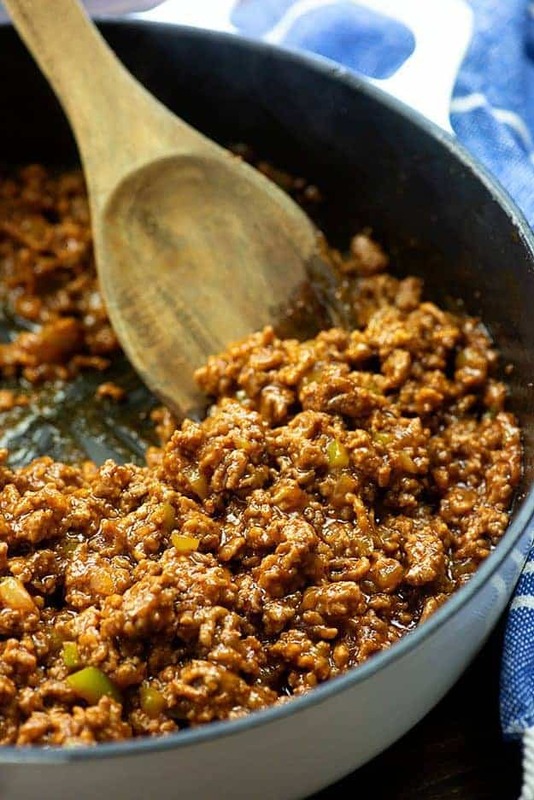 I was just thinking about sloppy joes tomorrow for dinner, then I check my email and this recipe shows up! I am actually allergic to an ingredient in Worstershire sauce, is there anything I could sub in it’s place or would leaving it out affect the taste? They look delicious!! And P.S. 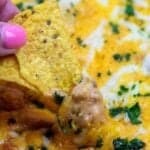 I pretty much eat tacos every week too, or your cream cheese enchiladas ? Have you ever tried fish sauce? It sounds strange, but it adds a similar savory flavor. Otherwise, just leave it out. I think it’ll be fine without it! Quick sub in my kitchen would be soy sauce or steak sauce (generic Heinz 57? A-1?). If you want to play around I’d try molasses, vinegar, garlic powder, a pinch of salt – slightly heated to meld flavor, then use or cool. Karen, could you be reacting to the anchovies which are dissolved in the barrels of sauce when they make Worcestershire. The anchovies release a chemical which jumps up and slaps us in the face, and we cry “ooh mommy!” Sorry, Umami. Some folks I know substitute WS for fish-sauce as they cannot find the latter in markets in their area. Now I have a reason for making that recipe of burger buns I’ve been putting off. 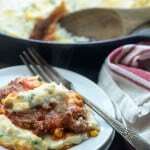 And I’m liking the idea of fusion foods with this sloppy joe mix — sloppy jose tacos, sloppy juan burrito, sloppy guiseppe pizza… thank you Karly. You just keep knocking it right out of the park. Yes, Gregory, it is the anchovies I’m allergic to! Thanks for the thoughts! 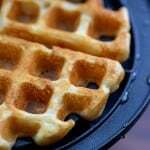 I made these last week and just omitted the WS and they were still great! ? Karen, there are several anchovy free Worcestershire sauces. Just search for “vegetarian worcestershire”. I made this dish for dinner and it was a hit. It was well loved by my entire family..The sloppy Joes were delicious..I will definitely make again. This is almost the same recipe that I copied out of a magazine nearly 65 years ago. 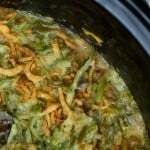 I made it for our friends a couple weeks ago for lunch when we got together to do some canning. Yummy as always! It has been a favorite for all these years. Always a big hit when the morning moms in the neighborhood got together and the question always was “What are you doing with your hamburger for dinner tonight?” I did not use Worcestershire sauce in mine and it was great. 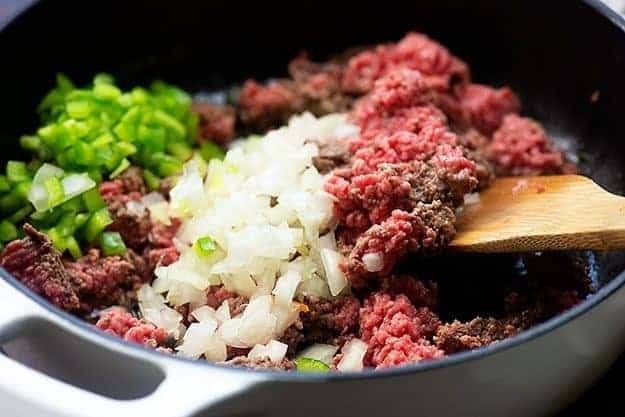 My sloppy joes are better, they are made with corned beef, large onion chopped, 2 pounds of hamburger, a mixture of flour, liquid brown sugar and chili powder and ketchup and simmer for 30 minutes! Is there anything that can be done to lower the sodium? It’s awfully high. Use reduced sodium ketchup and omit the salt. 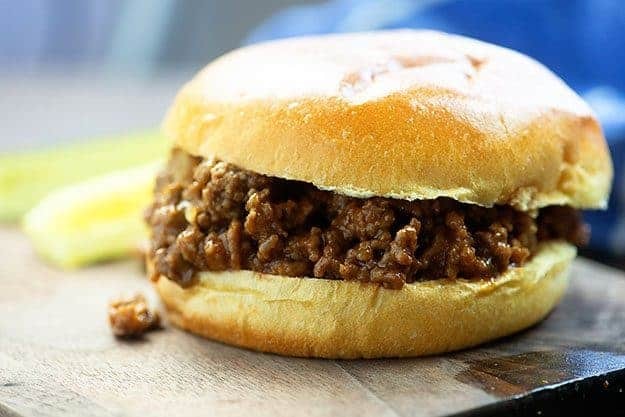 I love them too, but have kinda forgotten about them, and I’ve always only defaulted to using the sloppy joe spice packets, so love that these are home made, thank you! Thank you for the recipe. These are absolutely awesome!!!! I made these last night for my family. My family loved it. Just enough for a family of three. I had enough for one more. But I made tater tots on the side with coleslaw. I omitted the pepper and left the onion in. My family also fears peppers and onions. But I compromise by really mincing the onion. Half the time I put onions in and they don’t know. I also used ground chicken. Great recipe.